Wine, salads, and dessert too. Despite the proliferation of salad-focused chains like sweetgreen and Tender Greens — and local copycats — the salads at such fast-casual spots tend to be... fine. Just fine. A mighty exception is Plenty, where the salads are not just generously portioned and hearty and nutritious but legitimately delicious. 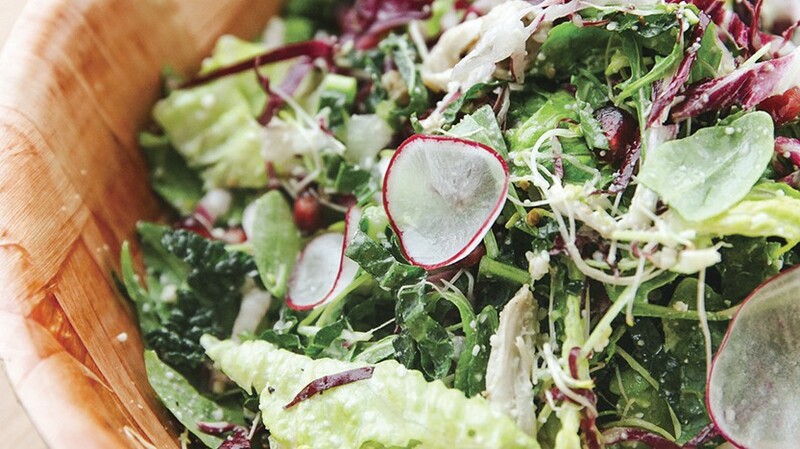 The lemon chicken romaine comes with a powerful, lemon-anchovy vinaigrette. The bacon spinach avocado salad's blue cheese buttermilk dressing manages to feel surprisingly light. And there are loads of add-on options with varying levels of healthfulness: marinated tofu, kimchi, and smoked salmon, but also duck fat gravy and fried chicken. These are salads that aren't going to leave you hungry three hours later. — J.B. There are a lot of great drinking establishments on Alameda's naval base now, but they're not all created equal. Namely, Rock Wall still boasts the most leisurely seating arrangement with top-notch views of the San Francisco skyline. On a warm but not too warm day, those spacious lounge seats are tough to beat — especially with a glass of Sparkling Grenache Rose, which is a refreshing, easy sipper on a menu dominated by fuller-bodied, tannic reds. With a mineral finish, it tastes like strawberries, watermelon, and summer. — J.B.
Poke, the raw fish salad, is a staple meal in Hawaii for good reason: It's hella refreshing on a hot day. Now, poke spots have all but taken over the East Bay. So, it was no surprise when Fish Face Poke Bar, the first Bay Area outpost of a popular Sacramento eatery, came to Emeryville's Public Market. But Fish Face is decidedly different from the standard poke joint, which beckons with unlimited toppings, suspiciously low prices, and lots of rice — in other words, ways to give you as little fish as possible. At Fish Face, rice is ordered on the side and toppings are kept to a minimum so you can taste the quality of the sushi-grade tuna, salmon, sturgeon, and octopus. Yes, it's more expensive. Yes, there's no fake crab. Yes, the only free toppings are onions, seaweed, and sesame seeds. But when the fish is good, that's all you need. — J.B.